At the start of this year I read a fantastic literary novel by the name of Last Bus to Coffeeville (you can find my review here). I was very impressed by this debut from author J. Paul Henderson and as the months have passed by I've found myself becoming an unofficial campaigner for the book (go #TeamCoffeeville!). So when I was asked to be a part of a virtual roadtrip to celebrate the novel, I of course immediately said, "Yes"! 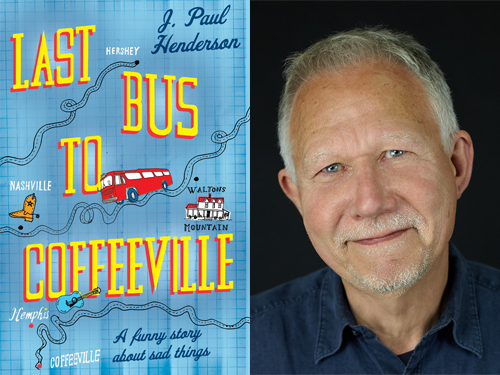 For this blog tour stop I asked author J. Paul Henderson if - like the characters in his novel - he was travelling on a tour bus once stolen from Paul McCartney, what would be his top places to visit and who would he take along for the ride? The road trip would start in Savage, Minnesota and end in Death Valley, California; a journey of some 2,000 miles and a blend of big scenery and oddball cities. I’d travel with the five friends I meet up with for a long weekend every year; they’re proven travelling companions and would suit the confines of a tour bus well. We’d take our own coffee – Percol Guatemala – drink it black and eat the occasional biscotti. Savage is a place I’ve been to, but never actually seen: I once boarded a towboat there in the middle of the night. That was in 1973, and ever since – and somewhat inexplicably – I’ve always been curious to know what the town looks like. It also has the advantage of being close to Minneapolis, and this would be our first stop. The city was the backdrop for The Mary Tyler Moore Show, which aired from 1970-1977 and blew every other television sitcom out of the water. There’s a statue of Mary in the Nicollet Mall and we’d go visit her: it would be an act of pilgrimage. On to Las Vegas: a city of misshapen hotels and a wonder of the artificial world. We’d roll our eyes and roll the dice; stay for a night and wonder if it was daytime. We’d be all the poorer for having stayed there, but all the richer for having left. Death Valley would be like a breath of fresh air. The valley was named in 1849 by prospectors heading for the gold fields of California. Oddly, despite Death Valley being the lowest, driest and hottest place in North America, only one prospector ever died there. At its lowest point (282’ below sea level), we’d abandon the tour bus and phone for a taxi. It wouldn’t be a particularly fitting tribute to Death Valley to have Paul McCartney’s tour bus parked there for any length of time, but for us the act would be symbolic and – as we’d all be out of the country by the time anyone noticed it – also one without consequence. Which, after all, is what Paul McCartney’s music is these days. Thank you very much to Paul for this fantastic enlightening post! Last Bus to Coffeeville is out now and you can purchase a hard copy from Waterstones, Amazon.co.uk, Amazon.com or your own preferred retailer.